There are certain things that always brings you back to the good old times when you were a kid. In those days, the biggest decision you had to face was probably as “inconsequential” as what book to read, what game to play, or which cartoon character would be dubbed as your favorite. Naturally, we long for those days when we seemed to be as carefree as possible. One of the things that evokes childhood memories and emotions for a lot of people – of my generation, I suppose – is the the Muppets. These creations of the genius Jim Henson has impacted the lives of countless people from all walks of life, from the four corners of the globe. Truth be told, my memories are rather hazy, but I cannot deny the warm, fuzzy, happy feeling that the puppets bring. 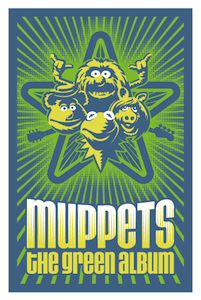 Later this month, we are all going to be treated to a brand new music CD titled Muppets The Green Album. If you were exposed to the Muppets even slightly as a kid, I am pretty sure that there will be interest somewhere. The title of the album is obviously in reference to the Fabulous Four’s “The White Album”, but I think that this album of a different color just might make you happier. If you were/are an avid follower of Miss Piggy, Kermit the Frog, and the rest of the muppets, then you will most certainly love what the album offers. Here is the track list, together with the artists covering the songs. Here’s the best part if you are impatient – NPR featured the album yesterday and they also offer the entire album for listening! You don’t even have to wait for the official launch of the album to actually hear the songs. I have listened to a couple, and I have to say that you ought to listen to the happy, trippy “The Muppet Show Theme” first. Follow that up with Rachael Yamagata’s cover of “I’m Going to Go Back There Someday” and you’ll be enjoying your Monday like nothing else! Listen to the entire Muppets The Green Album, or individual tracks, over at NPR. “The title of the album is obviously in reference to the Fabulous Four’s “The White Album””…or maybe weezers green album? ?